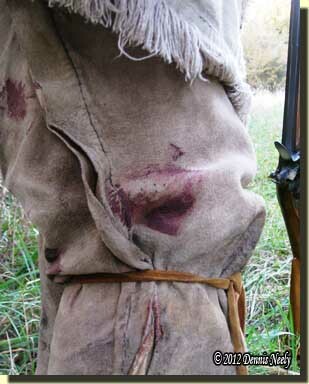 A fine buck’s fresh blood stained the leggin’s top. Dark burgundy-colored spots, flung in a tussle with a young tom turkey a few days earlier, dotted the front of my linen hunting shirt. Reddish-brown blotches marked the shirt’s dirty hem-fringe. Assorted splashes, splatters and smears offered quiet testament to a host of fox squirrels, green-headed mallards and a cottontail rabbit brought to the table. A resolute silence embraced the forest on that calm and peaceful evening of 1795. Not long before, my worn-out buffalo-hide moccasins stepped from the wagon trail’s west rut and bid farewell to future tribulations, those of November, in the Year of our Lord 2012. A leaning red oak, a fallen poplar with hunks of its frayed bark suspended by wispy fibers, two dead and bare cedar trees and a thick tangle of rotting limbs, twigs and branches afforded respite in the Old Northwest Territory. I sat cross-legged on a wool blanket roll. My left shoulder touched the leaning oak’s rough bark. Charged with a ball, the trade gun rested across my leggins. To my right, a gray squirrel whined and chirped in a not-so-far-off tree. Before me, down the hill’s steep west slope, the huckleberry swamp looked hazy and drab and impenetrable. Behind, over the ridge, a wild turkey chattered an emphatic protest that I interpreted as “How dare you get in my way!” On the leaning oak’s far side the yellow sun’s upper half peeked from behind the distant tree line. Overhead, the evening sky looked plain and ordinary, more grayish-white than ethereal blue, dashing hopes of a vivid orange and lavender sunset. Looking down, I watched a small, cream-colored spider struggle to make its legs move as it climbed toward the fresh blood stain on my right leggin. The spider’s path seemed to weave from one stain to another, each earned from an honest attempt to relive the 18th-century hunter’s life. Some evenings, the splendor of God’s smallest creatures brings a humble woodsman the greatest joy. In the solitude of my wilderness Eden, little happenings such as this tend to rekindle fond memories, whether of that day’s hunt or ones from long ago. My son-in-law discovered the fresh blood on the leggin top after we dragged his buck from the woods. He was upset when he first saw the smear and apologized, offering to wash it off as he cleaned his hands with a handy wipe. “Don’t give it another thought,” I said, “that stain is ‘period-correct,’ the unmistakable badge of a successful chase.” That was the first time my grandson, who is six, sat with his father in the deer woods. The morning proved memorable in many ways. I will not look upon that blood stain, at least as long as it lasts, without thinking of a father and son standing side by side as they gazed at a downed, eight-point buck. Unfortunately, I have a propensity to wade into heavy wet grass, a habit that often soaks my leggins and the thighs of my fustian breeches. I do so in pursuit of deer, most times without conscious thought as to the consequences. I fear that in the heat of a chase those bloodstains will be washed away, and that disappoints me. Now, my son-in-law is a modern hunter, so the bloodstain was not period-correct with respect to the methodology used to take the buck. Yet, as I sat watching the cream-colored spider navigate from stain to stain, I realized the dried, red blotch emphasized a point, a pet peeve of mine, if you will. For you see, I make no apologies for the bloodstains on my 18th-century clothing, just as John Tanner or Meshach Browning or Daniel Boone made none for theirs. Traversing muddy swamps, downing game, skinning, cutting up and packing out the meat and hide were all part of a messy business. The rips and tears, the dirt and mud, the blood and fat of a robust woodland chase contributed to the impression left by an 18th-century woodsman’s distinctive dress. Yet many of the old journals make no mention of the stains and smudges of the hunter’s profession, perhaps because the badges of a forest pursuit were too common to warrant the expense of ink and paper. I say “experienced woodsman,” to make my point: traditional black powder hunters are experienced woodsman, as opposed to living historians who are portraying a hunter—there is a huge difference. My intent is not to demean any living historian, discount their dedication to an authentic interpretation or devalue their contribution to our understanding of America’s history, but of late there seems to be a divide developing among those who enjoy living history. 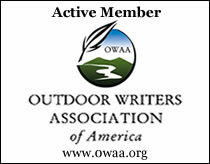 Within the past year, I have been taken to task by several respected members of the living history profession/hobby for the “unnecessary” inclusion of actual hunts in my writings or during my presentations. On another occasion, I found myself assailed by five re-enactors who looked like they just stepped out of a carefully crafted vignette at The Henry Ford or the Michigan Historical Museum. Their outfits were impeccably tailored, hand-sewn and aged to perfection, right down to the Frankenstein stitches that repaired a supposed tear in the flap of a brain-tanned shot pouch. In their case, I suffered a stern admonition to stop writing about killing game. I was told in no uncertain terms that traditional hunting had little place in the living history community, and further, that my writings were not consistent with historical documentation. A little taken aback, I explained that the tales are based on first-person experiences derived from a series of living history simulations designed to re-create the life of a woodland hunter in the late 18th-century. The stories report the results of my attempts to duplicate, to the best of my ability and within the confines of the game laws and accepted conservation practices, the journal entries and narratives of my personal hunter heroes. As an aside, I discovered that between the two fellows, they had fired only a couple dozen round balls from their Bess’ in twenty-plus years of portraying British fort hunters; none of the three women had ever fired or loaded a muzzleloader, and from their facial expressions and general reaction, none ever will. The point I wish to make is that traditional black powder hunters are living historians, and as such, we chose to follow our living history simulations to the ultimate conclusion, just as our hunter heroes did, the taking of wild game. From the perspective of learning about and reliving a past time, little difference exists between the hunter bringing fresh venison to the table and an authentically dressed lady laboring at an open hearth to produce a loaf of bread for the table. The personas are different, but the results are the same. Thus, I do not wish to admonish or criticize the living historian who portrays a hunter, but has never fired a live round at fur or feather, or does not know what it is like to feel a deer’s inner warmth gush forth on a cold and snowy December morning. Rather than tell someone they must stop writing in a given way, stop expressing the voice of their historical experience, I prefer to embrace the fact that there are many paths to unlocking the mysteries of yesteryear. The path I choose is to expend an honest effort to put wild game on the family dinner table, and that endeavor includes the dirt and grime and bloodstains earned in a fair-chase pursuit. If someone disagrees with the traditional black powder hunting philosophy, then all that I can ask is that he or she tolerate my approach to living history, just as I tolerate and respect a living historian’s choice not to take game or to enter the glade with a Brown Bess charged only with gunpowder. For you see, I make no apologies for the bloodstains on my 18th-century clothing, just as John Tanner or Meshach Browning or Daniel Boone made none for theirs. This entry was posted in Clothing & Accoutrements, Deer Hunts, Worth thinking about... and tagged Dennis Neely, historical trekking, North West trade gun, Northwest trade gun, traditional black powder, traditional black powder hunting, traditional blackpowder, traditional blackpowder hunting. Bookmark the permalink. Dennis, I think that your approach to experiencing the lives of our forefathers is right on track. Out here in Afghanistan, your blog has become nightly reading for me, and I look forward to every story you have to tell. Thank you for doing what you do, and for doing it well. Your tales have kept this old Screaming Eagle company on many a sleepless night. It’s humbling for a writer to discover that his words give comfort to someone halfway around the world. I can’t thank you enough for your support, and I want you to know that you, and all the folks serving in Afghanistan, are in our prayers each day. I’m hoping to get back to once a week posts, if not more often. This has been another hard summer/fall for us, and the time traveling and subsequent stories have had to take a backseat to family needs. Hopefully we’re emerging from the valley. I also have no problem with those who choose not to hunt, but I don’t criticize them for that decision. I have no dillusions about where our forefathers got their meat, they killed it. If we all bow to what we perceive to be politically correct we will miss out on what we are trying to achieve, a faithful interpretation of 19th century life. That can’t be done without occasionally getting a little bloodstain on our leggings. Again, great job, Denny and well said. Also good job to the son-in-law. Dennis, Thank You for not making ANY APOLOGIES about your bloodstains! I enjoy remembering the hunts that each stain on my hunting shirt bring to mind. There IS a place for hunting in the living history world! I always look forward to your latest post and quite frequently find myself re-reading past articles. Keep up the good work. 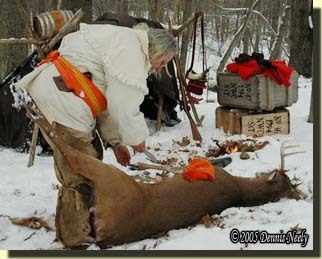 I am having a hard time grasping the concept that there are historical reenactors who will not acknoledge the fact that hunting was very important to the survival of the first americans. They of all people should know. This is political correctness running amuck. Thankyou Dennis for telling it correctly. Like you, I cannot fathom how a living historian can portray a frontier hunter and at the same time be critical of another living historian taking this persona to its logical conclusion, but that is the way of the world right now. To all, thank you for your kind comments and support.